Modern and rustic Birthday Invitations for yearly birthday and milestone celebrations. Popular birthday designs include soccer birthday party invitations, under the sea Quinceañera invitations, purple lily 50th birthday invitations, winter onederland invitations, and more. These invitations are custom printed with your celebration details on the quality invitation card stock of your choice. 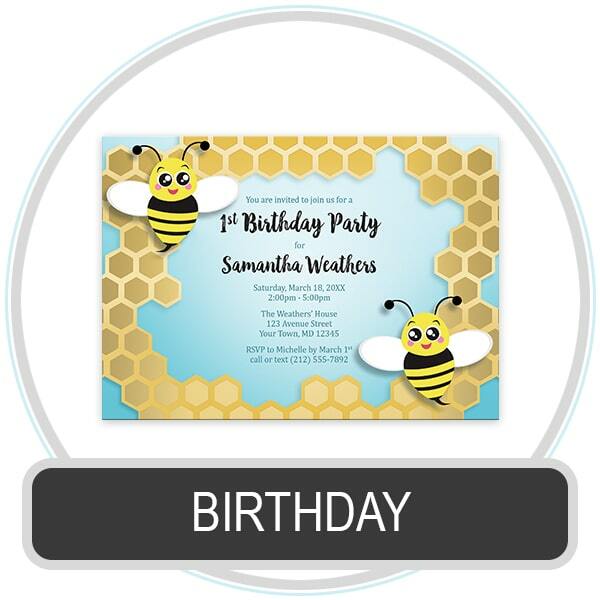 Provide the wording you need for your child or adult birthday invitations. The wording or occasion can be different from the pictured example. Change the wording, if necessary, to fit your special celebration or milestone birthday party. Included with your purchase is a complimentary proofing process so we can get your custom invites just right! After your purchase you will be emailed a proof image of your invitations with your wording for your review and approval, before anything is printed. Your invites are printed on the top quality paper type of your choice.